Trump called intelligence assessments of Iran "passive" and "naive." President Donald Trump on Wednesday declared "tremendous progress" has been made defeating ISIS and there is a "decent chance of denuclearization" in North Korea, pushing back at assessments top intelligence officials made to Congress. He also insulted the intelligence community's report on Iran as "extremely passive and naive," adding "Perhaps Intelligence should go back to school!" 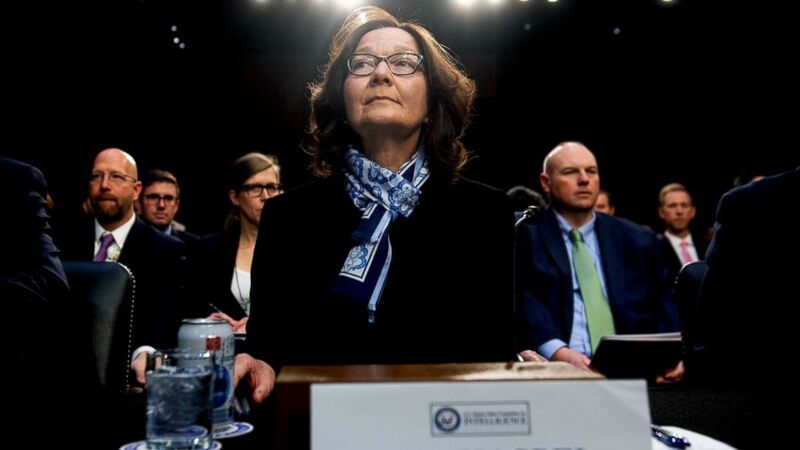 (Saul Loeb/AFP/Getty Images) Gina Haspel, director of the Central Intelligence Agency testifies on Worldwide Threats during a Senate Select Committee on Intelligence hearing on Capitol Hill in Washington, D.C., Jan. 29, 2019. On Tuesday on Capitol Hill, top intelligence officials, including Director of National Intelligence Dan Coats, FBI Director Christopher Wray and CIA Director Gina Haspel, painted a much different picture of global threats, including from Iran, the Islamic State's position on the ground in Syria, and North Korea's willingness to denuclearize. Their "worldwide threats" report Coats presented said Iran has not been undertaking activities that could develop a nuclear device, a position the president in a tweet on Wednesday called "wrong." The president said, "Be careful of Iran." In a series of foreign policy focused tweets Wednesday, the president undermined his own stated position that ISIS had been "defeated," saying that the "Caliphate will soon be destroyed." "When I became President, ISIS was out of control in Syria & running rampant," the president tweeted. "Since then tremendous progress made, especially over last 5 weeks. Caliphate will soon be destroyed, unthinkable two years ago." But the tweet contradicted the president's claim six weeks ago at the U.S. has "defeated ISIS in Syria." Vice President Pence also declared two weeks ago that we have "crushed the ISIS caliphate and devastated its capabilities" -- just hours after ISIS claimed responsibility for a terrorist bomb attack that killed four Americans in Syria. Coats disputed that as well, saying that while ISIS has suffered losses, it is "intent on resurging and still commands thousands of fighters in Iraq and Syria." Ahead of a second summit with Kim Jong Un slated for next month, the president said the relationship with North Korea is the "best it has ever been" but he seemed to hedge his bets on the odds of North Korea denuclearizing. But that is not the assessment of top intelligence officials, who on Tuesday asserted that despite ongoing negotiations between the United States and North Korea, the regime has not been straightforward about its intentions. "The regime is committed to developing a long-range armed missile that would pose a direct threat to the United States," CIA Director Gina Haspel said. The White House maintains that the goal is still complete denuclearization. “Our goal is to achieve the final, fully verified denuclearization of the DPRK as Chairman Kim committed to in Singapore,” a White House spokesperson said in response to the intelligence community's testimony. Democratic Sen. Mark Warner, the vice chairman of the Senate Intelligence Committee, weighed in with his own tweet: "The President has a dangerous habit of undermining the intelligence community to fit his alternate reality. People risk their lives for the intelligence he just tosses aside on Twitter." The president's foreign policy positions aren't only at odds with his own intelligence chiefs but even some of his Republican allies on Capitol Hill. ABC News asked the White House about McConnell's amendment, but they would not offer any comment on the record. President Trump was scheduled to receive an intelligence briefing at the White House Wednesday morning. ABC News' Benjamin Siegel and Mariam Khan contributed to this report.